Sohadat – In December 2018, staff, students, education department officials, parents, and the community came together to thank the Jesuit Refugee Service (JRS) for establishing the Sohadat School over the past 10 years. In 2019, the school’s operations will be taken over completely by the Afghanistan government’s education department. Mr. Karimi, the headmaster, reflected on the founding of the school and its positive affect on the community. He thanked the education department and community leaders for supporting JRS through their cooperation and contribution. “Besides the school and community, JRS also encouraged local female school graduates to do their higher education so as to better serve their people. 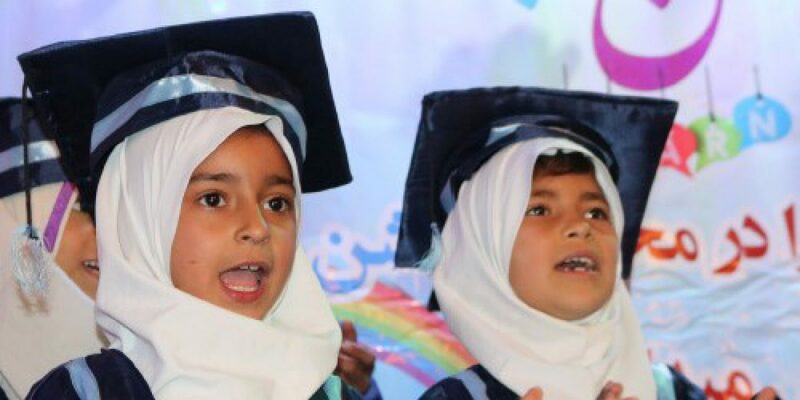 JRS has transformed the community through education, and parents are now ready to support their children’s education, especially girls” says Ms. Khorshid, a teacher at the school. Mr. Mayar, a JRS project director, congratulated the graduating students and thanked the staff, the education department, community elders, and parents. He encouraged the community to continue advocating for education so that the children could continue their studies and look forward to a brighter future. The Arbab of Sohadat thanked JRS for building the foundation of their community, which was previously in darkness like a dry desert. He believes JRS changed the community into a bright garden, full of flowers. The parents now send their children to school instead of sending them to work in the fields. Graduates of the school are now enrolled in Herat university, and some have pursued higher studies abroad. During these years of JRS involvement, Sohadat School has become one the best schools in Zendajan district of Afghanistan, and is considered a model among schools in Herat Province. The Sohadat school is widely praised for the many improvements and achievements in the community. The Afghanistan education department official also thanked JRS profusely for its support over the years. He expressed his sadness that JRS will be moving on, but feels confident that the school will thrive after years of JRS support. The gathering concluded with the installation of a commemorative plaque and wall painting, in remembrance and gratitude for the JRS engagement in Sohadat Township and celebrating the miraculous return of Fr Prem Kumar SJ who spent months in captivity while working in the region. Afghanistan has great potential and is blessed – 30 million people, a vast land and a lot of resources. Your country could be better than any other in the world. Your girls especially have a lot of talent and skills. So I urge you to make use of all the opportunities that come your way to get empowered. You need to be agents of peace; you need to have a global perspective; you need to study a lot, train and inspire others, and take leadership by contributing your skills and education to rebuild your society and country.